Caolan Ryan has vowed to ‘kick on’ at Chinnor as the fly-half looks to build on his outstanding start to the campaign in National One. The 26-year-old back excelled on his league debut, kicking 16 points, in Saturday’s superb 26-11 win over Plymouth Albion at Brickfields. Ryan joined the Oxfordshire side from Rotherham Titans in the summer and opted to move to Kingsey Road despite his old club dropping down to the third tier after relegation from the Championship. Last term, he received the Coaches Player of the Year award for the Titians and Ryan is now hoping he can continue his form for his new club. “I think it [the move to Chinnor] was about going from full-time to part-time rugby,” Ryan said. When you are considering part-time, there are lots of things that come into account. “At Chinnor, there was a lot that could benefit me in terms of working and I am also able to do a part-time degree as well so the reason to join the club was more to do with the off-field aspects really. “Saying that, I spoke to the coaches at Chinnor and saw the calibre of squad they were going to have this year and I got the sense that this was a team that wasn’t going to come up and just battle relegation, but a team that could really compete. “We had a good pre-season, but we didn’t really have any tight games so it was a bit of an unknown in terms of how the team would perform against Plymouth and also how I would perform myself so I was delighted. Ryan has played most of his rugby in National One so coming into the league with Chinnor wasn’t an entirely new experience for him. The former Coventry and Darlington Mowden Park player helped guide Chinnor to their victory against Plymouth, but he insists it was a massive effort from the forwards that got Matt Williams’ side over the line. “I think the win against Plymouth confirmed that we are going to do well this year,” he said. “I think the set-piece was huge. They were a big pack and we had a game plan to try and move them around the park, but in the end, the forwards won us the game. “As a backline we didn’t unleash! We had our video review of the game and it was strange to go away and beat Plymouth and have a meeting that wasn’t great! We probably played 50 per cent to our ability. 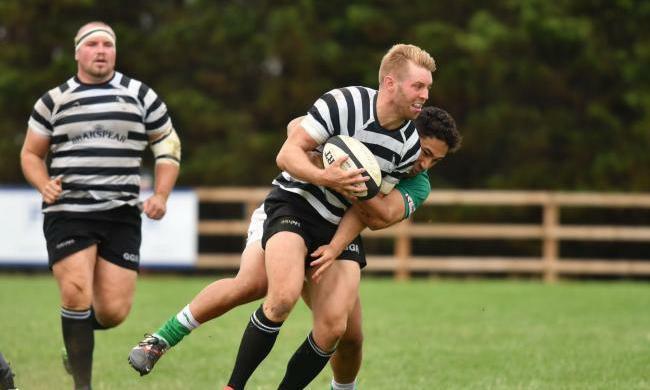 Despite Ryan admitting Chinnor may have been below-par in Round One, the Black and Whites were still able to clinch their maiden win in their first ever game in National One. Plymouth are still one of the promotion contenders for this season and Chinnor are now preparing to face another candidate for top spot when they host Ampthill and District this weekend. The A’s finished fourth last term and begun this season with a 43-34 win over Loughborough Students. This will be Chinnor’s first competitive match on their home turf since clinching promotion to National One in May and Ryan can’t wait to play in front of his new supporters this Saturday. He added: “I am definitely excited to play at Kingsey Road. You do have a look at the attendance figures in some of the leagues and Chinnor has always been a place that has had quite a few people down on a Saturday watching so I am really looking forward to it. “Ampthill are a team that I have played against a couple of times in National One so I know what they can bring. “It is the same again for us. We are not really sure how the game is going to go, but we are quietly confident that if we perform well, we are good enough to beat them and that is outlook for the season.